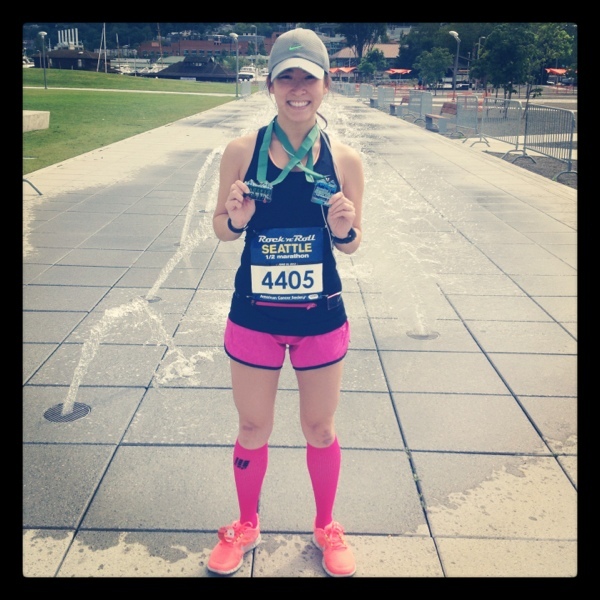 Seattle gal passionate about running, food, and life. This race recap is seriously overdue! It’s been such a whirlwind week and just now getting time to collect my thoughts in this post. 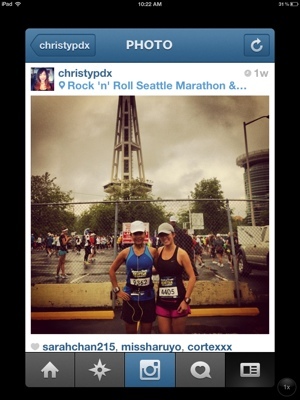 The Rock ‘n’ Roll Seattle half marathon this year was my third time running the race. I ran it in its inaugural year, 2009, skipped 2010 (the year of letting myself go), and ran it in 2011 and now this year. The difference with this year’s course was that they completely changed up the entire course! 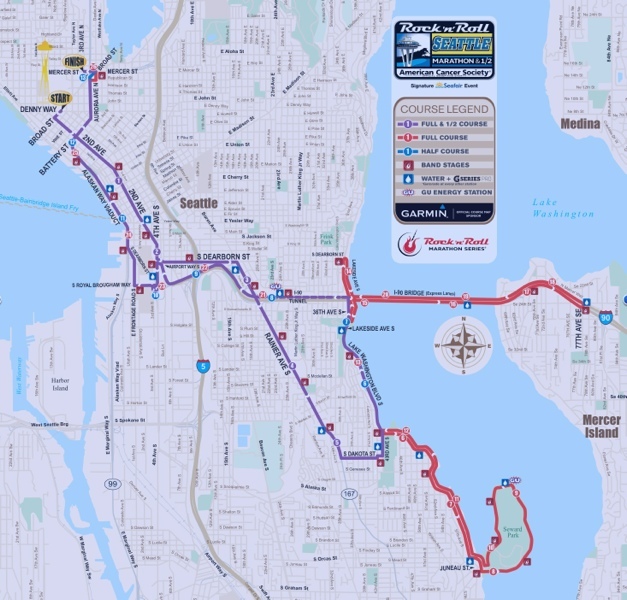 Instead of like previous years starting in Tukwila, meaning super early shuttle buses from downtown, the race started AND ended at Seattle Center. This was great for me since I live on the east side of Lake Uniom, just a short ride to the starting line. What I loved about this course was that it felt like a completely brand new race. Some components of the half route, such as the I-90 tunnel portion, were the same but lots of new scenery! My twin besties since middle school, Becky and Christy, signed up for the race and came up Friday afternoon to stay with Joe and I. Love when they come to visit. 🙂 Do it more, guys! 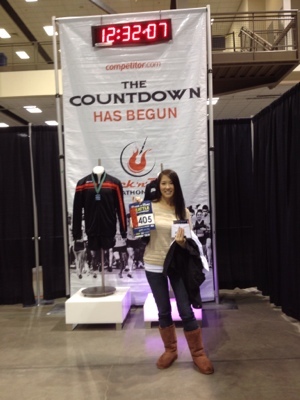 As soon as they got to Seattle, we hit up the RNR race expo to pick up our race packets and bibs. For me, it felt like deja vu! This year alone I’ve ran three Rock ‘n’ Roll races — the inaugural Portland half, the San Diego full, and now Seattle half. Next up: Las Vegas, baby! We made it to the expo with about 1.5 hours to spare before the expo ended. Wonder if any runners missed the expo end time? That’d be so stressful. 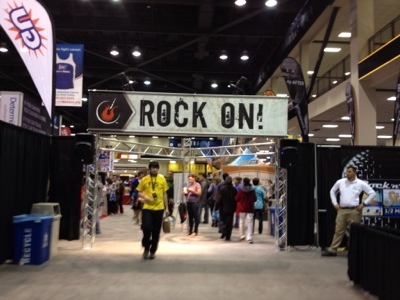 We didn’t up up spending too much time at the expo, but Joe and I each bought a pair of CEP compression socks. Joe had bought a pair of these at the RNR Portland expo in May and have loved wearing them since. I’ve worn Zensah Compression Apparel compression sleeves, and have liked the compressed snugness of my calves, but these new CEP compression socks were not only stylish (hot pink) but super snug and comfy! They enveloped my entire leg and foot and felt great right off the bat. I highly recommend checking out the Zensah or CEP’s.The only negative is that I broke a personal race rule – don’t ever try anything completely new during a race. Go with the tried and true gear. The race resulted in a super horrible blood blister on one toe, super painful. Start off with baby steps especially with new footwear. Lesson learned. Anyway! After the race expo, we headed over to a wonderful Italian restaurant called Ristorante Doria in the University District neighborhood. Go and check out their reviews on Yelp: Ristorante Doria. They now have nearly 100 reviews with overall 4.5 stars. This was our second time there and I’d agree with such a high mark. By the time we sat down, I was so famished! We started off with an amazing calamari appetizer to share and, of course, a big bread basket with olive oil for dipping. If I could just live off of bread, I would. Total bread girl. For my entree I went with a safe dish – tomato-based sauce on rigatoni pasta with sausage. This was so incredibly good! Sadly I didn’t capture a photo of it since I completely wolfed it down. Becky and Christy got a puttanesca dish on gluten-free pasta. GF folks, they do offer gluten-free with any of their pasta dishes! Joe ended up getting a chicken entree with a side of pasta. Yum all around. Saturday morning wakeup time came before I knew it. I got up at about 4:15am to eat my pre-race breakfast of a bagel with peanut butter and chia seeds. For some reason, it was extra hard to make myself finish it all. 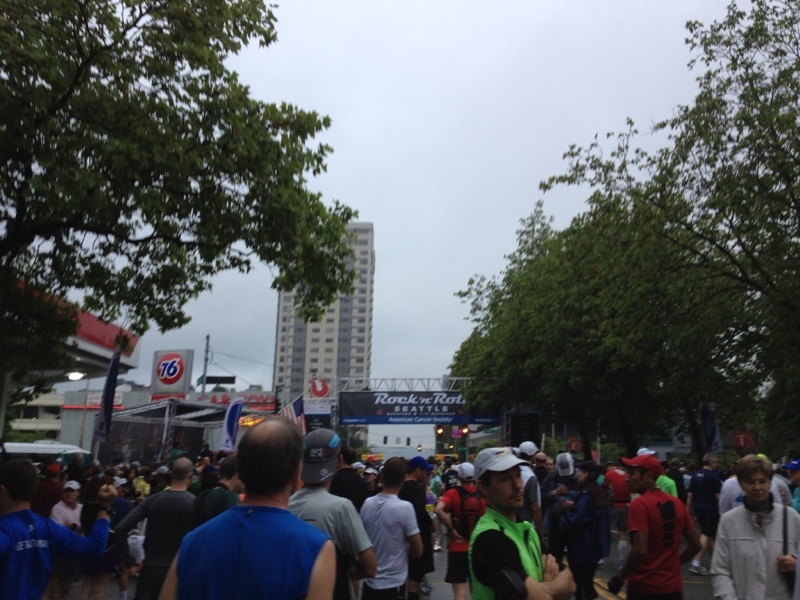 Got ready for the race, put on my gear and bib, filled up my water bottle, and off we went! Joe is the best fiancé ever. He was nice enough to get up super early to leave the house at about 6:15am and drive us over towards the starting line. Thanks, Joe! When we got to Seattle Center, we waited at the porta potty lines for a few minutes before deciding screw it since we had already used the bathroom at the house numerous times. We took a couple pictures in front of the Space Needle, wished each other luck, and said our good-byes to head to the corrals. It was almost go time! I snapped a photo of the start line from corral 4. My predicted finish time was 1:45, same as my most recent two half marathon times. However, I had a feeling I wouldn’t be able to do as well during this race. I had done one short run during a 3-week exercise hiatus leading up to is race due to my RNR San Diego full marathon fall/injuries on June 3rd, just 3 weeks prior. Uh oh, not feeling prepared at all. Not running for several weeks definitely has a major impact. Oh well! I was ready to run this race just to say that I did it! As soon as we crossed the start line, I was ready to go. Immediately I saw on my Garmin that even keeping a low 8 min/mile pace was going to be a challenge, if not impossible, for me. My previous halves have been sub 8 min/mile for most of the race. “Just do it! 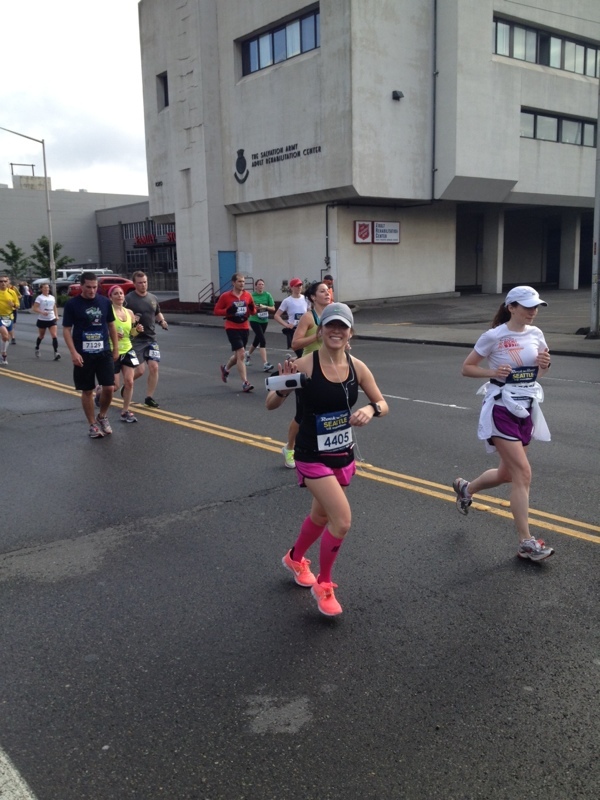 If you can do a full marathon, you can do another half,” I kept telling myself. Just keep on going despite any fatigue or pain. All was good until mile 6.5-ish. This epic hill was one of a few during the whole course, which is why I think that the course was much hillier than the previous Seattle courses. This hell hill, as I lovingly refer to it, was completely uphill and as soon as I got to the top, it was completely downhill. It was so steep that I had to slow to a slow shuffle down the wet hill for fear that my shoes was slip and slide and ultimately lead to another run-induced fall. Not good! Check out the elevation map for the half to see how this hell and others panned out. Throughout the race I decided to try a different race tactic and bring a handheld water bottle so that I could stay hydrated the entire race. So glad I did this time around as I needed to actually re-fill at mile 10 or so. I was running on empty after finishing the I-90 tunnel/highway portion of the race and stopped to dump four more cups of water into my bottle. The last few miles of the race were a blur. I remember running up the viaduct towards the city when I started feeling super fatigued. I stopped and had to walk several times on the viaduct and took an Ibuprofen gel cap that had melted in my pocket. Disgusting. The pain started to set in. The last .2 miles of the course was also difficult! I envisioned a flat finish across the finish line, but instead the last .1-.2 miles was completely uphill… then finish line. I was about out of gas, but gritted my way through. 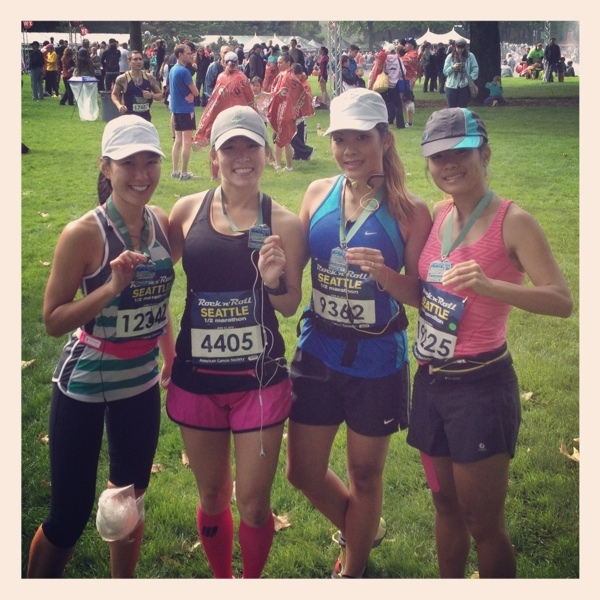 After the race, met up with Clarissa, Becky, and Christy to catch our breaths and do a couple photos. 🙂 Runner girls! Next race where us four will be together is at least the Rock ‘n’ Roll Las Vegas half marathon in December, a nighttime race along the Vegas Strip. Should be a good time! 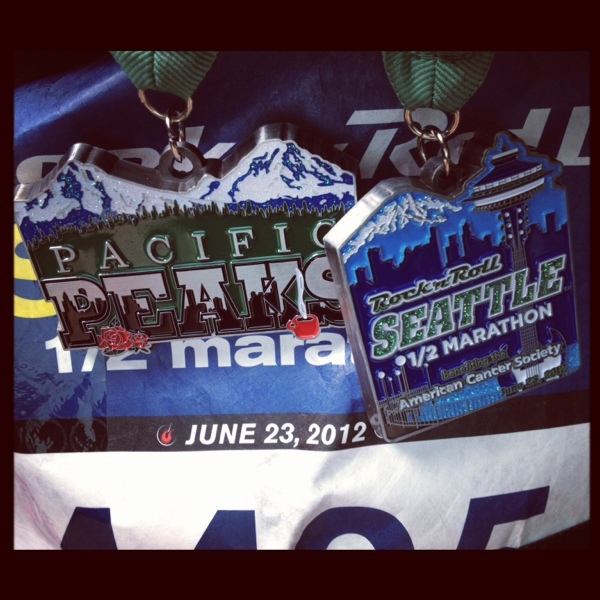 Got the Pacific Peaks medal for running both the inaugural Portland and Seattle races. Bling bling! Post-race, we walked about 1.5 miles over to South Lake Union due to the traffic closures where Joe picked us up. Got showered and dressed and met up with our friends, Sarah and James, for brunch and cocktails at Chandlers. 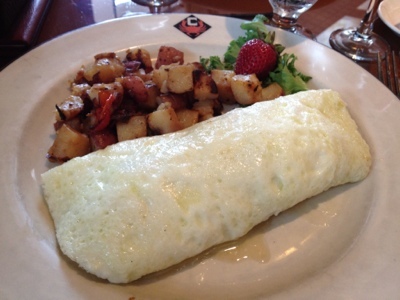 I got the crab egg white omelette. Deeeelish! 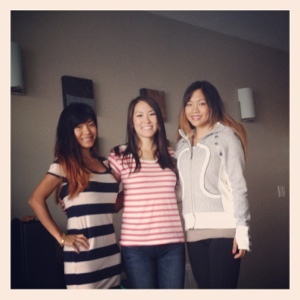 Saying good-bye to the girls! Great recap! You’re a speedy one, even if this was 9 mins slower than the last few! 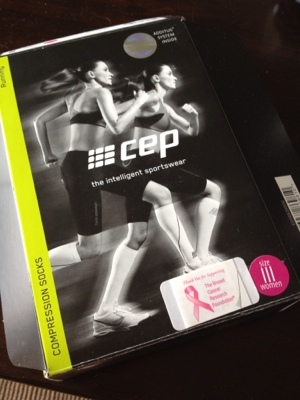 I have the same pink CEP socks that I have always used for recovery – I want to try running in them but am nervous about the blistering potential. Sounds like something to do during my upcoming training. Oh and maybe I’ll see you and your gang in Las Vegas! 2) They are indeed Lululemon shorts. I love them, not too short and not too restrictive. And they’re in my favorite color pink. 3) I love my compression gear and want more! Have yet to try the arm sleeves — maybe once it gets to be Seattle winter again? Also love the hot neon colors. Fashionable and functional.